Classify this one as a Mac App recommendation, which I plan to do more of because I've been uncovering a lot great Mac apps and utilities lately. In my own words, Browserism is an app that manages all your browsers for you. And while I know it has a number of great features, the one that I can't live without any more is the ability to tell Browserism which browsers should open specific links. My use case is that sometimes I use my personal MBP for work. I use Safari for personal browsing and Chrome for work. It used to be that if some Slacked or emailed me a link, it would either open in Safari (my default browser) or I'd have to remember to right-click it and tell it to open in Chrome. Browserism allows me to set rules stating that certain domains (i.e. zendesk, confluence, salesforce, et.c) should be opened by Chrome regardless of where I click them. 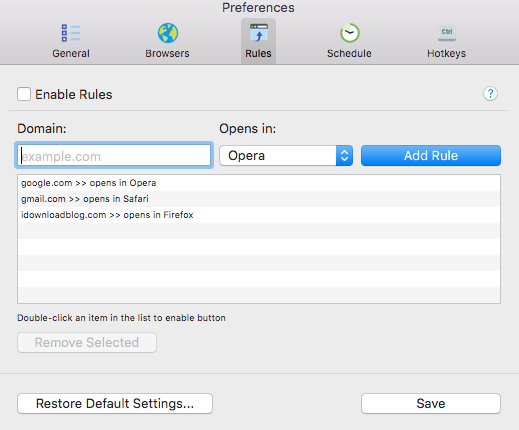 In addition to setting these global rules, I can also decide on a link-by-link basis which browser I want to use to open it. Probably the best $1.99 I've spent so far this year. If you're a fan of using multiple browsers, Browserism is definitely worth getting.